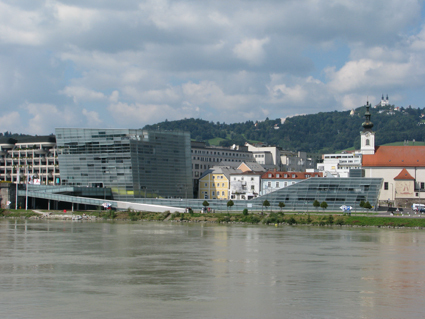 It’s that time of year again, the first week of September and you are in Linz for Ars Electronica. Let’s imagine you’ve been lucky enough to win a Golden Nica. You’ve arrived, installed your work at the O.K. (say oh-kah) Offenes Kulturhaus for the Cyberarts Exhibition. Everything’s working, you’ve done your interviews with ORF (Österreichischer Rundfunk/Austrian Broadcasting), been through the Ars Electronica Centre , met up with some friends at the Futurelab and now what? What else is there to do in Linz other than Ars Electronica? It does appear to have embraced almost every cultural venue in the city. Well the simple answer is enjoy as much Austrian cuisine and lifestyle as possible. 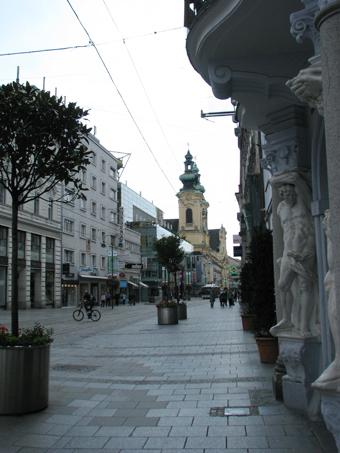 Walk whenever you have time through the most charming areas of the city: Herrengasse, Altstadt, Hauptplatz and along the Danube. A Linzer looking to relax might start the day with a Viennese style breakfast. Perhaps Traxlymayr on the Promenade for those living the high life, or Café Meier on Pfarrplatz. A brief but essential note on coffee for the Australian traveller. Ordering a café latte will get you something quite unlike what you love from your local coffee house. Don't go there! A long black is called verlängeter (fer-leng-e-ter), a cappucino is still a cappucino and my recommendation for the would-be latte drinker would be to try a Wiener Melange. A walk along Herrengasse can be recommended at any time of the day and close to the Dom (St Mary’s Cathedral) you’ll find Jindrak Conditorei, the one cake shop in town that can claim the right to the Original Linzer Torte (I use blind faith as a basis for this claim since every other cake shop in Linz claims to own the original recipe dating from 1653). Their other cakes are also amazing with unlimited combinations of sponge cake and flavoured creams. Definites to try are Apfelstrudel and Sacher Torte in any Austrian establishment. The Dom itself is magnificent inside and in recent years has hosted a night-time program of sound works during the festival. Wander up to the Linzer Schloss. 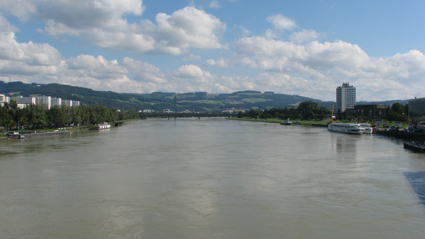 In fine weather the Schloss Cafe garden is a fine place to have a light meal or drink and look out across the Danube and the Nibelungen Bridge. If it happens to be Friday morning, there is a little farmers’ market on the Hauptplatz, a great place to buy yourself some bread and fresh produce. If the weather happens to be awful and/or your hangover from celebrating your Nica for the third night in a row happens to be too much, then a visit to the Parkbad Sauna Oasis is just the ticket. A swimming pool, indoor and outdoor in summer, combined with an excellent array of saunas and spa baths, makes a good comedown after all your hard work. For Dinner there are many options. If you have fine weather then find your way to Schindler’s Heuriger and order a Schindler’s Jauser. It’s perfect for two people, a simple meal of sliced cold meats, fresh brown bread, a few special dips like Kartoffelkäse (potato cheese) and a schnapps in the centre. Combine that with a Wieselberger beer or two and you’ll be feeling fine. A local wine festival has also wedged itself into the festival weekend in the Altstadt (old town) and this makes for a romantic evening sipping fine wines; try the Zwiegelt. 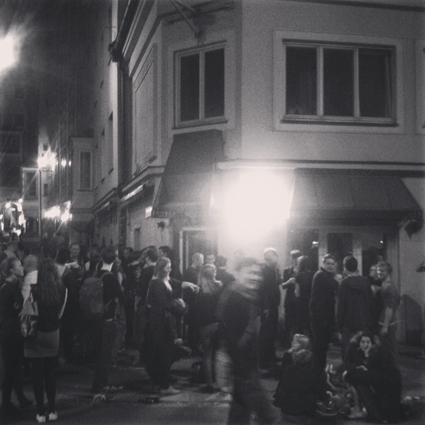 Alternatives, keeping with some Austrian traditions, include making your way to Gelbes Krokodil at the O.K. Platz or to Alte Welt off the Hauptplatz. Wirt am Graben (on a street called Graben) is really great if you can get a table, or embrace the beer hall tradition with the Stieglitz on Landstrasse. Cubus atop Ars Electronica always serves an excellent meal with a great view. 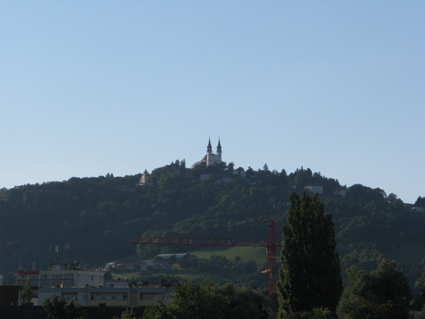 If you want to feel super special however, take the tram up to Pöstlingberg (that little Disney looking church overlooking Linz) and dine at the Pöstlingberg Schlossl with a table on the balcony. You’ll spend your hard earned Nica money, but you’ll eat and drink in fine style. And if after all that coffee, food, cake, wine, meat, beer you still want more and all those ice cream stands on the hauptplatz are tempting you, don't try them yet. Walk around to Eisdieler on the Promenade and enjoy one of the best ice creams ever. Seriously! If you’ve slept the whole day, you’re just waking up at night time and you’re back in festival mode, the two bars that are a must for the festival goers are Strom on the main deck of Ars Electronica and the Roter Krebs across the river. Going back along the Landstrasse you’ll find a few other watering holes including Walkers on Hauptplatz, which serves good burgers, or the Chelsey on Domgasse, a little English pub serving Guiness on tap. Extrablatt on Spittelwiese also serves good burgers and is open late. Finally you should be seen at Solaris in the O.K. or, on the Saturday night of the festival, upstairs at the O.K. festival party.